HCM City (VNA) - The Vietbuild International Exhibition 2019 with the theme of construction, industrial machinery and equipment and interior-exterior decoration will be held in Ho Chi Minh City from April 11-15. The first Vietbuild to be held this year in the city will also showcase building materials, electrical equipment, doors and accessories, water and air purifiers, industrial fans, labour safety equipment, solar water heaters, and others. It will have nearly 1,600 booth set up by 300 companies from 12 countries and territories, including Germany, Italy, France, India, Canada, the Republic of Korea, Japan, Taiwan, Malaysia, Singapore, Thailand, China, and Vietnam. Nguyen Tran Nam, Chairman of the Vietnam Real Estate Association and head of the expo’s organisation committee, said five Vietbuild expos with various themes will be held this year in HCM City, one more than last year. This is the first time the exhibition has the theme of industrial machinery and equipment and is welcomed by businesses, he said. 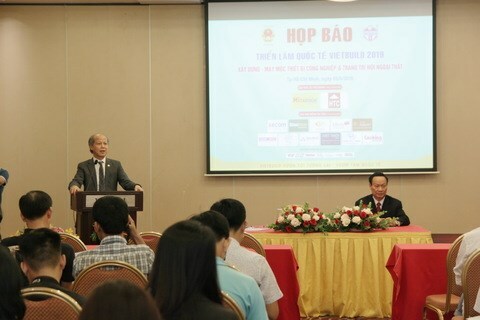 Nguyen Dinh Hung, Chairman of the Vietbuild Construction International Exhibition Organising Corp., said in addition to showcasing products, the expo would also have business-matching events and seminars on its sidelines to help participants understand about market trends.